Our lawyers offer personalized and customized legal service directly. When you work with us, you work with a licensed and experienced lawyer from the beginning of your initial consultation to the resolution of your case. Our Minneapolis personal injury attorneys are focused on performing thorough investigations. 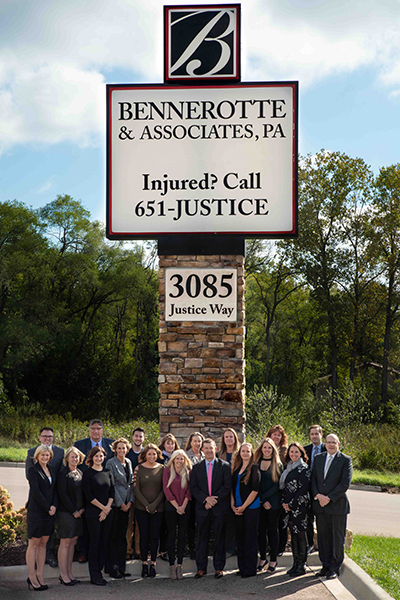 We inform, represent and advocate for personal injury victims and their families. 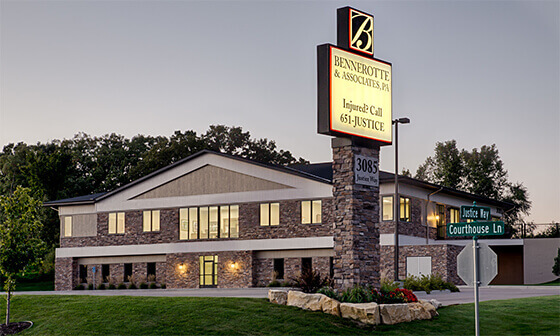 Based in Eagan, MN, our legal practice is statewide and unique. As a smaller law firm that practices personal injury exclusively, we leverage and optimize personally vetted resources. We serve our clients with passion and empathy, and we produce results. Our firm is part of a small group across the country that has obtained multimillion-dollar verdicts and settlements on behalf of clients who suffered serious personal injuries. We visit clients who are unable to leave their home or the hospital. We put our clients at ease, working as long as it takes to obtain the maximum compensation they deserve for personal injury, medical malpractice, property damage or wrongful death. We hold people and companies accountable for negligence and wrongful acts. If you or a loved one has been injured,contact us at 651-JUSTICE (651-587-8423). Our law firm is composed of Midwesterners, born and raised. The majority of our attorneys grew up in Minnesota and earned their legal degrees at William Mitchell College of Law in St. Paul. We listen to our clients and take the time to address the specific situations they face. We ensure their best interests lead their cases because we understand what it is like to suffer from loss and injury. In 1989, Tom lost his sister in a car crash. If our attorneys can do anything to help a person or a family victimized by a similar situation, we will — with sincerity and dedication. Your attorney will personally handle every aspect of your case. Our law firm is at your service at all hours of the day. We help you secure a difficult settlement and counter the aggressive tactics of insurance companies that attempt to reduce and minimize your claim. Contact us as soon as possible at 651-JUSTICE (651-587-8423) to schedule a free initial consultation.